It was only the first night that I was unable to sleep at summer camp. I was even able to become friends with one of my bunk mates, a girl named Lindsay. I don't remember where she was from, but it was from a place that one would acquire a southern accent from. She convinced me to join the Polar Bear Club which only involved getting up before the other campers and jumping into the freezing lake. I think I got some special award or patch at the end of camp for it, but it seemed highly overrated. Lindsay also liked canoeing, which was completely new to me. Each day at camp we would get an hour to do what ever we wanted, and Lindsay and I chose to canoe. Campers were also given the choice of a crappy old plastic orange kayak to use. So like, there was a free activity session, and Lindsay and I were canoeing around the lake, minding our own business, when this shirtless kid starts ramming our boat with his kayak. It really freaked me out because I thought we were going to tip over, so I pushed him away with my oar, but he continued to ram into us. In anxious frustration, I did something that to this day I regret.. 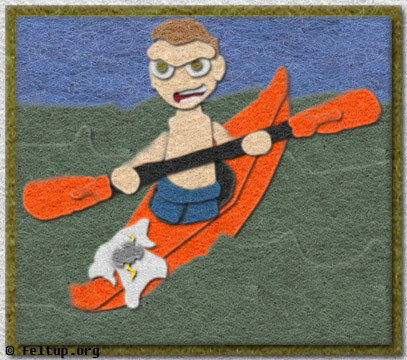 I took my oar and pushed his shirt off the end of his kayak. That stopped him from ramming us anymore. It was only a dirty white t-shirt with what seemed too small when I'd seen him wearing it previously, and had a hand drawn cloud with lightning bolts, but I was still feeling pretty bad about it.. Then we had to report to the flag pole because free time was over and it was time for some structured activity. Shirtless boy showed up, still shirtless, and his counselor yelled at because of the shirtlessness. He told him to go to his cabin and put another shirt on, but poor shirtless kid said he didn't have any other shirts. If, for some strange reason, shirtless boy is reading this: I'm very sorry for what I did, but you didn't have to be such a douche bag.